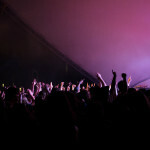 DALfest is a staple in student life at Dalhousie University, and has previously hosted artists such as Shad and Hey Rosetta!. 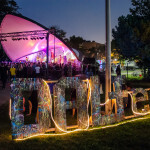 On Saturday, September 19, Hollerado made their way to the DALfest stage. The Ottawa natives recently released their newest album 111 Songs, a new project that stems from their love of their fans. Each song is customized and based loosely around a few facts that fans have sent to the band. The title track, Firefly, is an upbeat pop-infused indie rock anthem which is sure to have everyone singing along. The opening guitar is a reminder that this band got its start from their unique blend of indie and rock. This track showcases the progression of the band, not only in their sound, but also the way in which they write, produce and create songs. If it is Love takes you right back to the roots of this band, and is comparable to the sounds of Hollerado’s first album Record in a Bag. 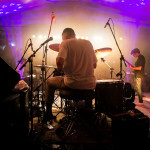 The song has a rock/folk melody which is enhanced by the amazing drumming styles of Jake Boyd. The balance between controlled chaos and the more calculated slow tempo areas creates a flow that highlights the guitar effects and tightness of the overall track. Synth-pop or synth-rock is a recent trend in the indie music scene and has grown in popularity over all genres. Coming Down has a dream-like opening that leads into a steady beat, underneath the almost choir-like vocals. As the song continues a funk beat is brought in by the bass and highlighted by vocals that reflect the urban and funk beat. 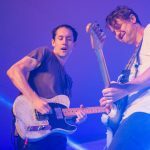 Steady Hand exemplifies the heavy guitar that Hollerado is known for, but contrasts it with the light pop beat that is at the base of this catchy tune. The track features lyrics that pull you in and a rhythm section that ties everything together in a pretty unique way. 111 Songs is the perfect combination of doing things the way they have always been done, and finding new inspiration and sounds from looking at music and why one creates music in a different way.